Since I've been stuck in the house for the last two days because of the Great Ice Storm of 2011, I started checking out some new blogs. There are SO MANY out there that I just can't get to all of them on a regular basis. I was over at Beth's Blog...musings of my everyday life and her posts about getting organized intrigued me. It's not a secret to my family and friends that I am not a very organized person and not the best housekeeper! It's not that I enjoy living in a mess...I'm just used to it. 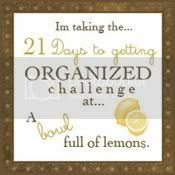 So I am going to try and do the 21 Day Organizing Challenge over at A bowl full of lemons. I'm off to tackle the Junk Drawer...probably should include the "Junk Counter" too! I'm starting today, too! Just doing one of our SEVERAL junk drawers, though. Good luck! Well I gotta give you credit for being ambitious in this task. Have you send the episode of friends where they find Monica's closet??? I'm kind of like that. It's all neat and tidy except for my one closet where I hide everything I don't know where else to put it and there's so much in it, that it would take way to long to clean out so I just leave it. Good luck with your organizing! Could it be done as the 21-week challenge? How am I going to get time to do that everyday??? Oh, I SO need to do this. I hate to say that I'm in, but I am in.